“Judge me by what I do,” Catherine Ashton declared when she took up the job of EU foreign policy chief five years ago. Her plea was issued amid grumbling in the corridors of power that she lacked experience in international diplomacy. Some of the grumbling smacked of sexism: a predominantly male elite felt uncomfortable that a slight and unthreatening woman had landed such an important post. As she ends her term, Ashton can be satisfied that she proved the grumblers wrong. The only real qualification needed for that job was a willingness to implement an agenda shaped by Washington, something that Ashton has been amply capable of doing. On issues relating to Palestine, this has meant siding with the oppressor, while feigning concern for the oppressed. For her first two years in office, Ashton repeatedly zoned in on the plight of Gilad Shalit. In elevating this Israeli soldier to the status of number one victim, Ashton ignored some salient facts. Israel habitually did far worse things than capture a soldier who was involved in a brutal occupation. One day before that combatant was taken prisoner in 2006, Israel kidnapped two civilians from Gaza and transferred them into present-day Israel. Not once did Ashton allude to this crucial background when calling for Shalit’s release. Ashton has refused to censure some of Israel’s most egregious human rights abuses. She claimed, for example, that Israel’s use of administrative detention – holding prisoners without charge or trial – was not necessarily illegal. That was bunkum. The right to a fair trial is enshrined in customary international law. The word “peace” has been constantly present on Ashton’s lips. She vowed to support John Kerry’s “peace” initiative, even before details of it had been made public. Kerry and his colleagues in the US government were undertaking a selfless quest for peace, according to her spin. The absurdity of having the top provider of military aid to Israel sponsoring “peace” talks was not deemed worthy of comment. Ashton has combined promoting “peace” with humouring war criminals. That is not surprising. Never elected to any office by the British public, she got her big break in 1999 when Tony Blair, then prime minister, appointed her to the House of Lords. Nowadays, Blair is frequently described as a Middle East “peace envoy” by the BBC, its journalists pushing the invasion of Iraq down a memory hole. Not only has Ashton worked closely with Blair, she has authorised the funding of his work. Providing almost $10 million between 2007 and 2013, the European Commission was second only to the US as the biggest donor to Blair’s office in Jerusalem. Ashton likes to celebrate her friendship with another bona fide war criminal, Tzipi Livni. As a senior minister under both Ehud Olmert and Benjamin Netanyahu, Livni approved large-scale bombing offensives against Gaza in late 2008 and early 2009 and during the summer of 2014. At that time Livni was in opposition. The following year, she was back in government again. When Israel reacted angrily to the publication of an EU policy paper stating that firms and institutions based in Jewish-only settlements in the West Bank should not receive financial assistance from the Union’s budget, Ashton contacted Livni to defuse the tension. The resulting agreement enabled Israel’s weapons-makers to continue soaking up EU science grants. Israel Aerospace Industries – a supplier of the drones used to bomb Gaza – is among Israel’s top ten recipients of EU science grants. Thanks to Ashton, it can apply for even more help from the EU taxpayer. Ashton has sought to expand the EU’s role as an enforcer of the occupation. Over the past few months, she has been trying to reactivate the EU’s “border assistance mission” for Rafah, the passenger crossing between Gaza and Egypt. When that mission has been deployed in the past, EU staff have accepted Israeli orders on who can and cannot leave the strip. Similarly, Ashton has overseen the expansion of an EU police operation in the West Bank aiming to boost cooperation between the Palestinian Authority’s forces and Israel. Throughout her term, Ashton has displayed a paternalistic attitude towards the Palestinians. When Salam Fayyad was the PA’s prime minister, she praised him for doing a “great job.” Part of that great job involved spending more on security than on health and education. Fayyad’s priorities reflected both a desire to placate Israel and the ideology inculcated in him when he previously served the International Monetary Fund. The IMF is an American-controlled body (albeit with a French head), preaching market fundamentalism. Ashton exerted pressure on Egypt and Ukraine to accept IMF loans that were conditional on economic reforms designed to widen inequality. Ashton was briefly fêted last year when she brokered a deal on curbing Iran’s nuclear activities. She has been silent, however, on how Israel introduced nuclear weapons to the Middle East. There is a squalid logic to her silence: as I discovered recently, the EU has been engaged in “discreet” cooperation with Israel’s nuclear industry since 2008. Contrary to the impression sometimes given by the press, Britain has considerable clout in Brussels. 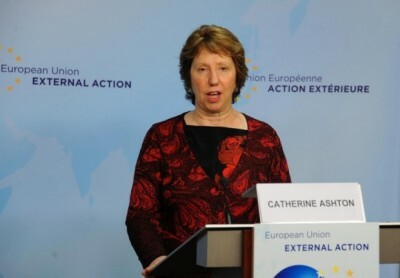 Catherine Ashton helped make the EU’s foreign policy indistinguishable from that of Britain and its American masters. Considering all the harm done by Britain and America, that achievement is a shameful one. David Cronin is a journalist and activist living in Brussels. He is the author of Europe’s Alliance With Israel: Aiding the Occupation (Pluto, 2011). His most recent book is Corporate Europe: How Big Business Sets Policies on Food, Climate and War (Pluto, 2013).